If you downloaded ActiveBarcode as ZIP, unzip the archive first. Now follow the instructions of the installation program. 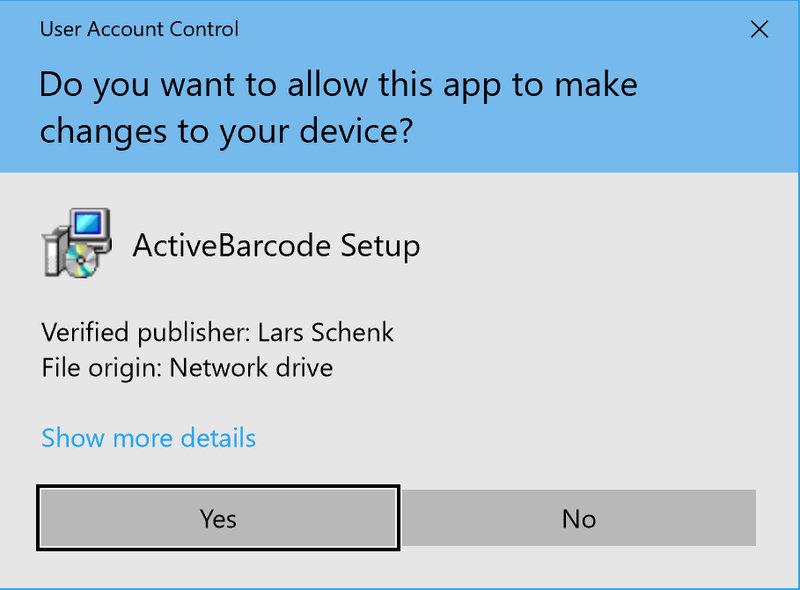 ActiveBarcode-Setup6.8.0.exe and all componentes are digitally signed by the publisher Lars Schenk. You need administrator rights for the installation. If necessary, ask your administrator to install the software. On a 64bit system, all required components for both 64bit and 32bit are automatically installed so that it is ensured that the required components are always available, regardless of the container used. The Office add-ins are automatically available after installation and do not need to be activated explicitly. The ActiveBarcode object is available system-wide. Installed ActiveBarcode components can be viewed under "Programs and Features". You can run the ActiveBarcode Generator from the start menu. Tip: The ActiveBarcode object is even more flexible and powerful than only the ActiveBarcode generator. Learn how to use the ActiveBarcode object and the Office Add-Ins. We have very useful hints for developers and admins for software deployments and automation. Please install your license. You have received instructions and installers for this with your purchase. After installing the software and the licenses, ActiveBarcode is installed, licensed and ready to use on your system. You can view installed licenses under "Programs and Features". ActiveBarcode is supplied with an uninstall routine, and can automatically be uninstalled. No manual action is necessary to uninstall. The "program and features" dialog is displayed. Here you can select the components to be uninstalled. Then follow the instructions on the screen.